The west-side entrance to this massive hospital complex is a busy place. Stand here for any amount of time and life's full spectrum of experiences will play out in all its colors and textures, from beautiful to, more often than not, decidedly less so. Thanks to decades of construction, this spot looks different than when I was a patient here so long ago. The parking lot and open space is now filled by sleek new buildings, and I have to look harder for familiar hallways. But you never forget childhood touchstones. I still remember this place as if it was yesterday, my parents either carrying me out to the car, or pushing my wheelchair. I remember other families coming and going, or patients simply marking precious time away from the monotony of life on the inside. And I remember the first time I saw a woman in a hospital gown, gaunt and hollow-eyed. She was probably barely older than my mom at the time, but she looked more like my grandmother, grey-flecked hair blowing in the windy snow flurries as she tried to keep her barely-tied-on gown from turning her into a peep show. She was smoking, and my 5-year-old self asked my mom, loudly, why. I couldn't reconcile the fact that she was doing something unhealthy to herself just outside a place where she was supposed to get healthy. My mom justifiably shushed me that day, and the adult me still wishes I could reach back in time and leave her be. Or simply observe her, quietly, from afar. 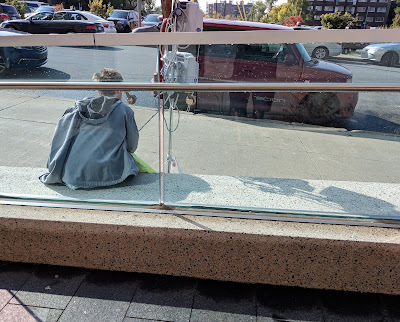 So when I saw this patient, IV pole on one side and a cigarette in the other hand, I knew I wanted a photo to remind myself the full spectrum of human experience need not always be pretty. Or logical. It just is, and it deserves to be remembered no matter how old or young we may be. How you process this scene is, of course, entirely up to you.